A prison inmate died on his second day on remand because staff failed to act on "obvious signs" he was at risk of self-harm, a report has said. Michael Folley, 25, cut off part of his ear and smashed hospital windows in the days before his death in 2017. He was found hanged in his cell at HMP Winchester after reception staff missed a "red flag" report on him, the Prisons Ombudsman said. The Prison Service said it accepted all of the report's recommendations. Mr Folley, from Portsmouth, arrived at the jail on 15 September 2017 after being charged with theft. 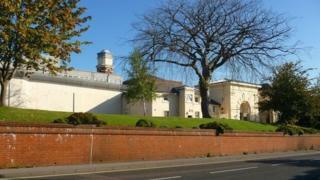 He was assessed by two prison officers and a nurse but no self-harm prevention procedures were begun, the report said. The following morning he was found in his cell and died in hospital two days later. An inquest jury recorded a verdict of suicide. In August 2017, Mr Folley was taken to a mental health unit after he was found near railway tracks in an "agitated state", the ombudsman said. The following month he was detained by the police after cutting off part of his ear in a public toilet in Canterbury. At the police station, he flooded his room and said he was hearing voices. On 13 September, he was returned to a mental health unit where he smashed windows, broke furniture and wrote in his own blood on the wall. A "red flag" report accompanied Mr Folley on his transfer to prison, indicating a "heightened risk" of suicide, the ombudsman said. But a supervising officer did not "assess the contents" or advise other staff. The ombudsman said all reports should be read fully by reception officers. Mr Folley was the ninth prisoner to take his life at HMP Winchester since 2014, the report said. In a statement, the Prison Service said it had "already taken steps to improve the reception service for prisoners at HMP Winchester". "We have recruited an extra 124 prison officers at the prison since his death and all prisoners arriving at HMP Winchester are now seen by healthcare nurses on their first day in custody," it added.